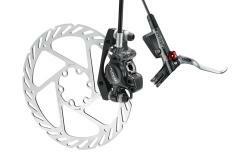 This is a Disc Brake that is designed for use on all Mountain, Cross Country, Freeride and Downhill bikes. It has a power reserve geometry, Tri-Align calliper positioning, with finely indexed reach adjustment, new refined lever body design and speed dial contact point adjustment. It also has drip-free bleeding and is Matchmaker compatible. It is available with 160mm or 185mm rotors.